Jason on Mobile Analytics, Tatsuki on Operas’s Vision and Matthäus working. Two days before the CTIA Wireless I joined together with around 50 other folks from the mobile industry a conference called Mobile Web Megatrends. 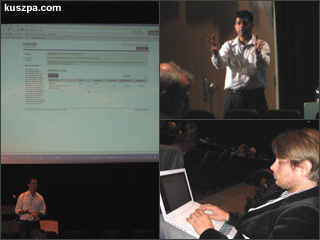 The event was hosted at the University of California, Berkeley and was organized by Ajit Jaokar (Futuretext). I mostly enjoyed the vital presentations from Matthäus Krzykowski (mobile facts) on Trends Driving the Mobile Web & Related Business Opportunities for Startups and Dan Mason (ESPN Mobile Web) on Mobile Web Discovery and Placement. But also Jason Spero (admob) had some interesting insights on Mobile Analytics and their new product AdMob Analytics. Apps for Mobile Devices – What happens next?